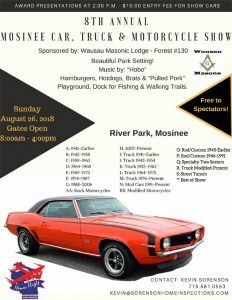 Gates open 8:00 a.m. to 4:00 p.m.
$10.00 Entry Fee for Show Vehicles – Free to Spectators!!! Award Presentation at 2:00 p.m. Dash plaques for first 150 show cars!!! Funds help to support Honor Flight, Center of Hoper Food Pantry & Mosinee High School Scholarships.